Just when I thought I would never get over the end of apricot season, I seem to have found instant resuscitation in the bountiful glories of peaches and berries. Fresh, sweet, tart, colorful, these are some of the best tools in my pastry toolbox. In one of my recent pastry reveries, I was thinking about Peach Melba. Created in 1892 at the Savoy Hotel by Auguste Escoffier for the famed Australian opera star Dame Nellie Melba, Peach Melba is simply composed of a dish of vanilla ice cream with fresh peaches and raspberry sauce. 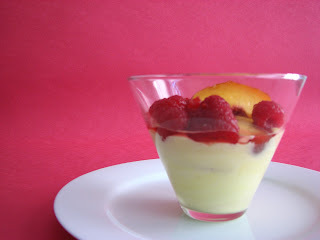 But I wanted something slightly saucier - a dish of peaches layered with raspberries and sabayon, an easy, quick, elegant and utterly delicious expression of the natural world. Sabayon, or zabaglione in Italy, is a light dessert cream made by gently whisking egg yolks, sugar and wine over a water bath. It is easy to prepare, takes just a few minutes and is a perfect complement for just about any fruit. Legend has it that zabaglione originated in 16th century Florence in the court of the Medici. The classical Italian flavoring for zabaglione is Marsala, but you can easily vary the type of wine used. Try it with your favorite fruity wine, Muscat, port, Madeira, cognac or champagne. Since zabaglione takes its primary flavor from the wine, use only the best and adjust the sugar in the recipe according to the sweetness of the liquor you choose. The texture of the sauce can also be loosened with whipped egg whites or whipped cream. Let your imagination work according to the fruit you are pairing. So let’s console ourselves with a pillow of Peaches Royale. Only nine months until apricot season. 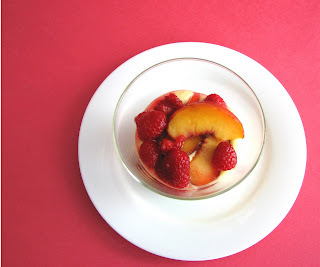 - For the sabayon, choose a wine that will go well with peaches and raspberries. I recommend a good quality fruity white wine, such as Beaume de Venise, Semillon, Sauvignon Blanc, Prosecco or champagne. I used a Monbazillac, a wine with aromas of honey, apricot, orange and a taste similar to Sauternes. - Another variation on this theme is fruit gratin, which is fruit layered on top of a bit of pastry cream, topped with sabayon and lightly broiled. It’s a truly incredible thing of sheer beauty and complete speechless surrender. Peel the peaches if you prefer and slice into thin wedges. Toss peaches and raspberries with about 1 1/2 T of sugar, to taste. Whisk egg yolks, sugar and wine in a stainless steel bowl. Place the bowl over a pot of simmering water, making sure that the bowl is not touching the water. Check periodically to see that the water is not boiling. Whisk constantly for 4 to 5 minutes, including the bottom and sides of the bowl. Cook until the mixture is thickened and expanded in volume. If you have a thermometer, you’re shooting for about 160 degrees. Remove from heat and continue whisking for a bit. Set aside to cool. Whip the heavy cream just until soft peaks form. Fold gently into cooled sabayon. Divide into each serving dish. Top with fruit and their juices. Here's Dame Nellie being a klutz in the "kitchen." Thanks for a rare look into Dame Melba's brief culinary career! This blog, “"Peaches Royale"” ended up being very good. I’m printing out a replica to show my friends.